Sometimes, due to circumstances out of our control, a dental extraction may be necessary. 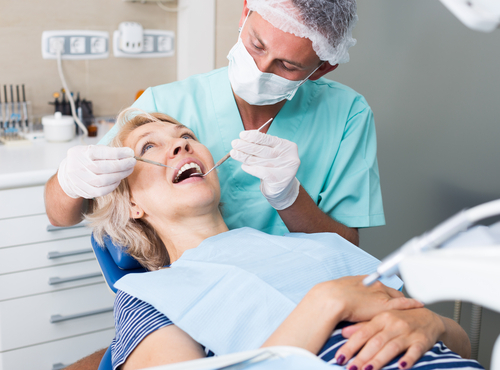 Also known as “exodontia,” this relatively common procedure is used to alleviate a host of dental conditions dealing with pain, tooth overcrowding, and unrestorable tooth decay. At Media Dental Care, we proudly serve the areas of Media, Swarthmore, and Aston with expertly performed dental surgeries and procedures, including dental cosmetics, to get our patients looking and feeling their best. We also offer tooth removal as part of our comprehensive approach to dental care. There are several reasons why tooth removal may be necessary. Commonly, if a tooth is broken, and the damaged portion is extremely large or even separated into several pieces, then an extraction may be required to remove the broken pieces and prepare the site for a bridge or dental implant. Another reason to undergo a tooth extraction is due to an exceedingly unhealthy tooth. Occasionally, teeth that have been badly decayed can pose a risk to the surrounding tissue and may need to be removed. This is especially the case if decay has destroyed the root structure, or the gum and site no longer support the tooth. Sometimes, wisdom teeth may be overcrowded, misaligned, or disoriented. They can even grow upwards and into the sinus cavity, where they can get impacted and cause pain. If an X-Ray shows these conditions are causing complications with your wisdom teeth, your dentist may choose to perform a wisdom tooth extraction before they create other problem or concerns. If your tooth is cracked, it can typically be repaired by one of our experts at Media Dental Care, who can also perform dental fillings and root canal surgery. However, a crack in your tooth can progress quickly, leaving you with a completely divided tooth which will most likely need to be removed, especially if its structural integrity has been compromised. The process of removing a tooth is typically straightforward, with anesthetic being used to block the sensation of pain. During the extraction, the tooth may be rocked back and forth to widen the socket for removal. While you may feel some pressure at this point, you will not experience any pain, only numbness for the anesthetic. As opposed to a simple extraction, sometimes a tooth may need to be removed using a surgical extraction. During this more-involved procedure, gum and bone tissue may be manipulated, and even removal may be necessary to allow for the appropriate excision of the affected tooth. After your extraction process, there will be some bleeding at the removal site. In addition, there may be some swelling and discomfort, and this is perfectly normal. You’ll probably be supplied with some gauze to staunch the bleeding and help a blood clot to form and allow the bleeding to stop. Covering the affected area with a cold compress or ice pack is also recommended to reduce any swelling or inflammation that you may experience. Any additional pain can be treated with an OTC pain medication, such as ibuprofen or another pain reliever. For the first 24 hours following your tooth extraction, refrain from smoking or rinsing your mouth. Stick to a soft or liquid diet if possible, and make sure not to inflict any damage to the extraction site. After 24 hours, use a saltwater solution rinse as prescribed by your dentist. For a simple extraction, you can typically expect the site to heal within five to seven days. Surgical extractions require more recovery time. We provide friendly and professional dental care to our patients in Swarthmore, Aston, and Media, PA, to allow them to improve and enhance their appearance and increase their self-confidence. To make an appointment for a dental extraction, or for any questions regarding our emergency dental care services, call us at 484-444-2793 or fill out our contact form.